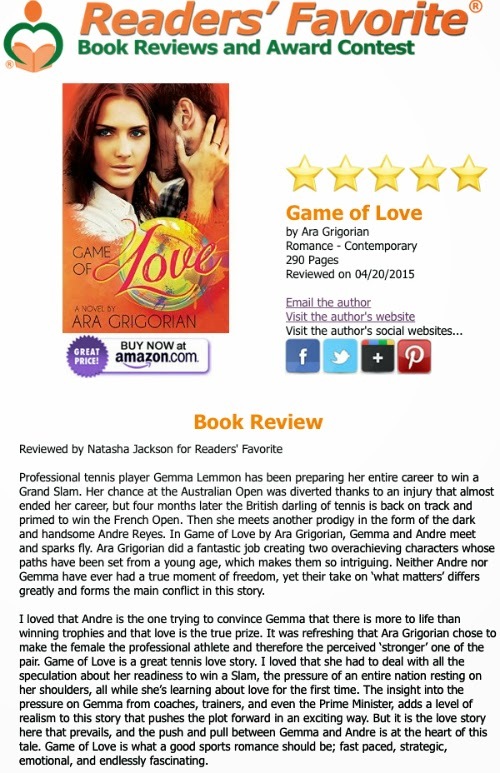 In advance of the May 4th release of my novel, I am very excited to announce that Readers' Favorite has given GAME OF LOVE a shiny Five Star Review. Let me be clear. Every single review, every tweet, email, and message is as valuable as the other. I am honored and humbled. It is always about the reader and what my stories do for them. What makes this special is that Readers' Favorite has a reach that will introduce my story to even more readers. My novel's cover can officially carry the emblem that is trusted by readers. I consider myself a sports fan, but know very little about tennis. Even so, this book is written in a way that even those who don't know a thing about the sport will not feel lost or lose interest. Ara Grigorian delicately weaves together sports and love in a way that is both humorous and heartbreaking. A wonderful debut novel that makes me excited for whatever he writes next. Thank you! I can't tell you how much I appreciate your kind remarks. I am delighted that you enjoyed the book. All the best! This is a fantastic book. I'm still in awe of Ara Grigorian's ability to weave the game of tennis into Gemma and Andre's whirlwind romance. It's beautiful. It takes an accomplished wordsmith to write such a layered, smart, and witty story. Well done! I look forward to more books by Ara Grigorian, his stories don't disappoint!